Predation by invasive mammals is a major cause of species extinctions globally. 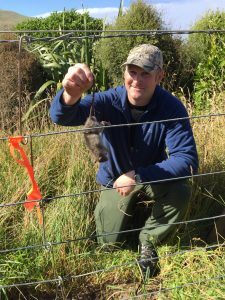 Invasive mammals are a particular problem for island nations like New Zealand where animals have evolved in the absence of such predators. Land-based predators which may kill penguin chicks or eat their eggs include mammals such as stoats and ferrets. Predation by cats is suspected, but there is no direct evidence. Dogs are capable of killing adult birds as well as chicks. Pigs are also an issue rooting up nest sites, eating eggs and even killing adult birds. Annual chick mortality can be as high as 60% in the absence of effective land-based predator control. Predation of hoiho in the sea is exclusively by native animals such as New Zealand sea lion and sharks. Barracouta are thought to cause accidental injury when they cross paths with hoiho or feed in the same area. All of these species have evolved together however and so predation events at sea are natural.